The set is reminiscent of a Yosemite lodge, complete with scenic moose rug, post-modern fireplace, trophies, bric-a-brac, and taxidermied busts. The projections and colorful background sky-scapes are beautiful and highly effective, as they morph to enhance the drama. 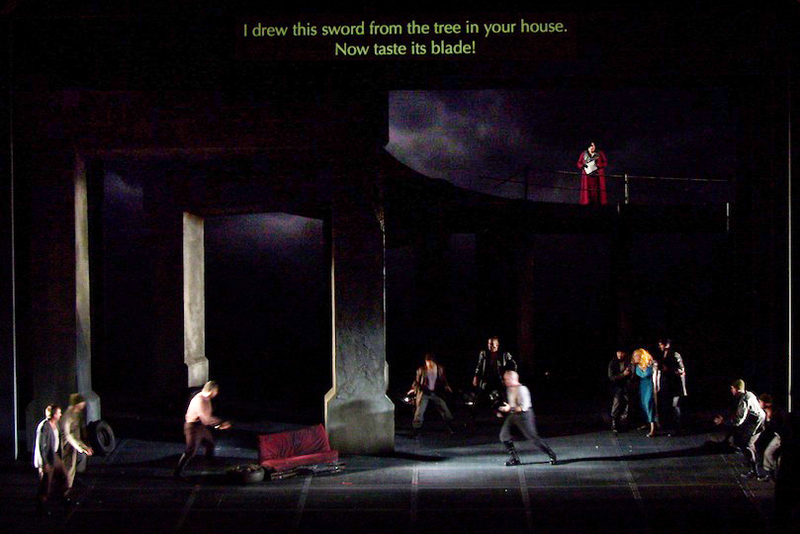 The central tree raises up, and the sky fills with a giant moon after Siegmund draws forth “Nothung,” the sword, from the tree (proving he is her savior), and the incestuous lovers consummate their destiny, with an onstage romp. God, I love opera! 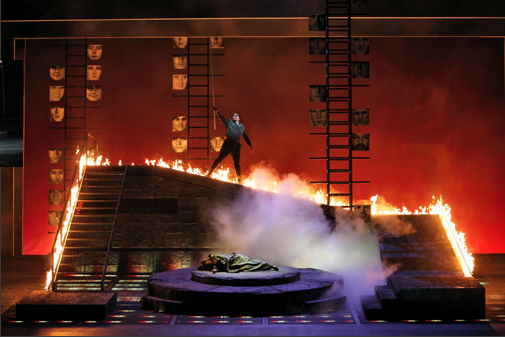 Wotan is introduced in this Scene I. 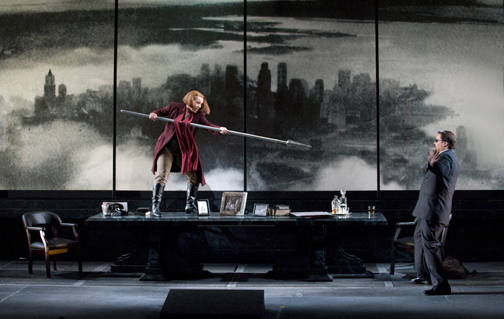 In this production, we see a board room-in-the-clouds, with Delavan portraying an archetype of the CEO with an iron fist, Fricka his controlling power-wife (less a goddess than usual), and Brünnhilde, a more realistic, temperamental daughter. At one point Hildy even hops on daddy’s back for some child’s play. These relationships prove very effective, in portraying marital tension and power struggles, and eliciting real emotion and associations from the audience. SF Opera has just shared on facebook that each of these photos “is of a serviceman killed in Iraq or Afghanistan. The images were incorporated into the production with the permission of each servicemen’s family.” WOW, that certainly adds further gravitas to the metaphor. Later in the same set, Hunding and Siegmund partake in a sword fight, to Siegmund’s fateful demise. The Supers get to knock Sieglinde around quite a bit. Eva-Marie tears up the scene, inserting yelps and horrified facial expressions that often leave us wondering if we went too far. But, no, that’s just very convincing acting, folks! It’s exhilarating bounding over the junk-yard trash during the Sieglinde chase. AND, we get to share the stage with two canine talents. Hearing the Stage Manager call “Milo & Humboldt to the stage” is quite funny! 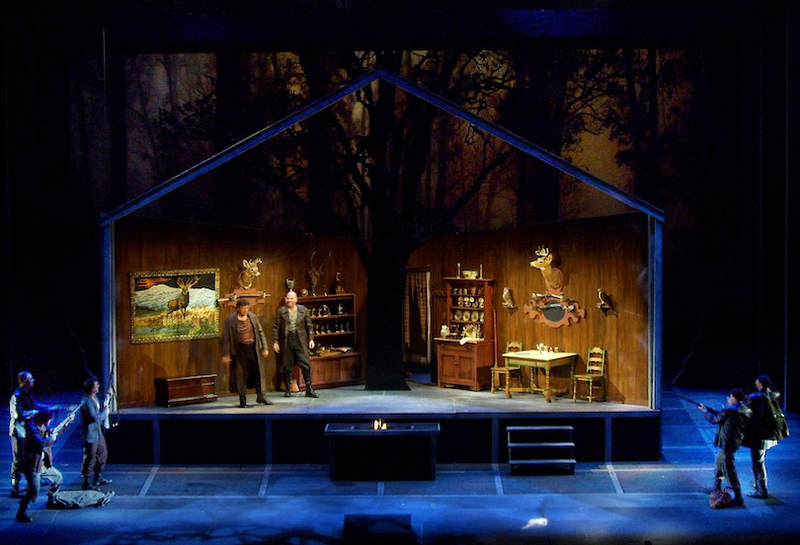 I’m glad someone else is responsible for their performance…with the variety of unexpected behaviors and surprises (ala the brown pile dropped in the final dress by the pony in La Fanciulla del West) animals can serve up onstage. 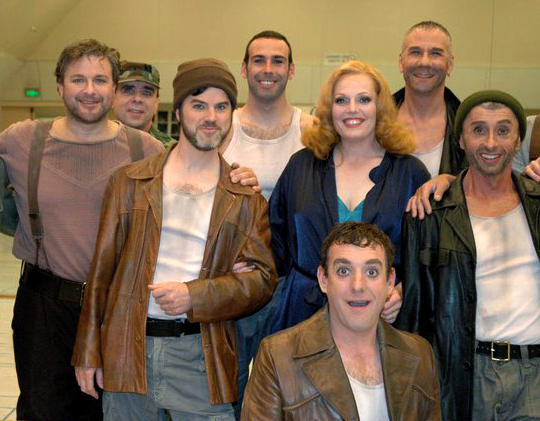 Photo: SF Opera Production Dept. I hadn’t done any fight scene choreography since a production of West Side Story years ago, so I was thrilled to learn a bit more here. What you think looks real up close is often not what does from a distance, especially in a big house like this. So, we have “fight call” each night beforehand to brush-up the scene, and keep it tight. Here’s a fabulous photo of us with some of the big guns right before our “fight call.” Thanks to them for being so agreeable! 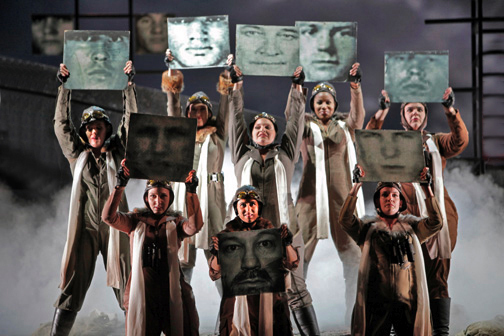 The Ride of the Valkyries is arguably the most rousing and familiar music in the opera. I particularly love this staging, where their stunt doubles (male stage hands!) “fly in” via parachute, at an angle that is very realistic. Oh, how I wish the male Supers had been engaged for this! I even said I’d wear a wig, if needed (no surprise there). This crew of Amelia Earhart-inspired gals are a tough crew, and deliver the vocal goods and fist pumps in droves! Cesca’s concept of female empowerment and sisterhood comes ringing through here. Here is the full casting list of Valkyries, led by Molly Fillmore (Ortlinde), Wendy Bryn Harmer, and Daveda Karenas (Waltraute)…an up-and-coming Brünnhilde, Sieglinde and Fricka (and I believe the understudies for those roles). This Act is the emotional core of the opera. 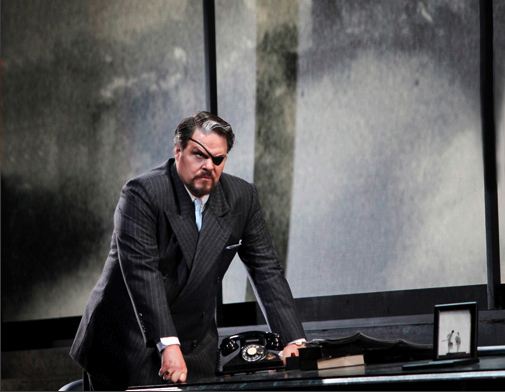 It is where we see Wotan (and Delavan) soften, and reveal his most vulnerable, paternal, and conflicted self. There’s likely not a dry eye in the house. This set and staging is particularly stunning (as you can see from the photo). The faces of fallen heroes, placed by the Valkyries hang on the ladder-like stage towers. 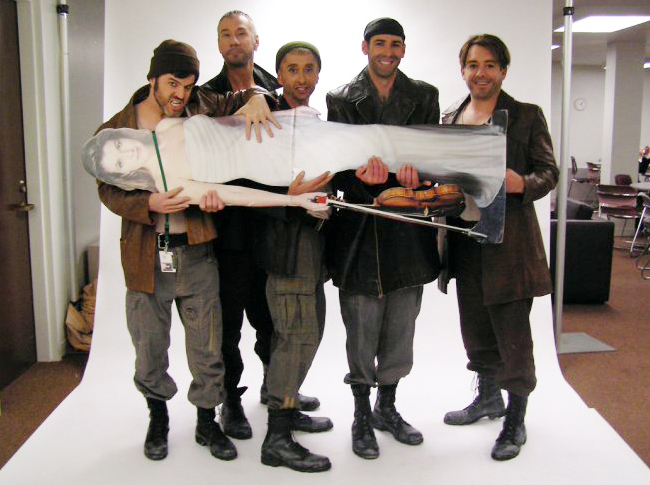 I leave you with another of our amusing backstage photo moments. The music library has as its door greeter a cardboard statue of Anne-Sophie Mutter. (Why, I don’t know…because she’s hot?) Well, she begrudgingly became our Sieglinde for this shoot. Amusingly, at first glance, especially when viewed small, she appears to be a prize swordfish. I doubt Hunding’s kinsmen ever scored one of them! These “Super”-men (including those not pictured) are indeed super, as are our three dressers, Super Captain (Paul Szczesiul, above center), Super Coordinator (April Busch), “Cesca,” and all the ASMs, ADs, makeup artists, and so on. We have such a great time. See more photos, and ALL the Supers at spearheadnews.com and in this fine backstage slideshow compilation. Only one more performance is left. Don’t miss it! And, if you do, come back for the full cycle next season! « Our Pink Martini Music Video Won 4th Place! Very nice inside view of this Walkure production. ‘Super’ story, I would say. It really adds something to the countless reviews I’ve read about this particular production. I think you’re right about Eva-Maria, she’s very sociable. Recently she had an interview with Musicalcriticism.com mentioning a lack of ambition in my country (the Netherlands). I think she’s right about that. Unlike the USA, in the Netherlands people are reluctant to follow their dream. I’m glad Eva-Maria did and that she still manages to not get carried away. Proud of her. Thank you kindly for the comments Rob. Boy, Eva-Marie sure is following a dream, eh?! I simply cannot wait until she returns to the SF Opera. She is such a special artist…and to see her return in La Gioconda, Die Frau ohne Schatten, or some other gem that few sopranos today could sing, let alone make memorable (as she no doubt would) would be a real coup and joy! She surely is a fine ambassador for The Netherlands, just by example: her passion, career success, and the good natured way in which she interacts with others.